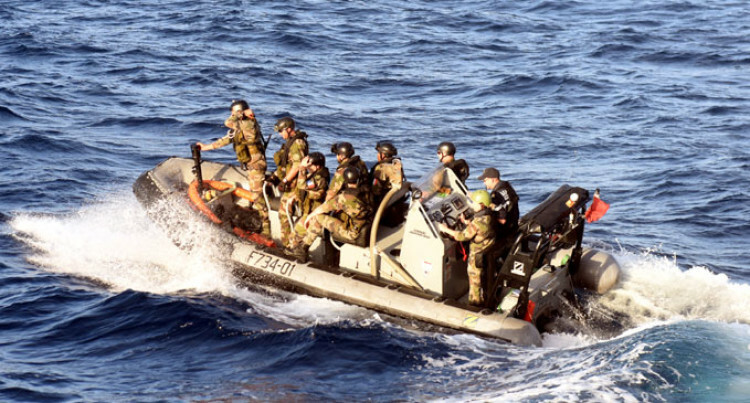 The Fijian and French navies have stepped up the fight against illegal fishing, among other things, with a joint exercise in waters near Kadavu. France’s Ambassador to Fiji, Michel Djokovic, described the exercise – which involved the French Navy frigate Le Vendémiaire – as a success. “The joint exercise was held in Fiji waters involving a Fiji Navy patrol boat and it went well,” he said. The exercise ended early yesterday and the Le Vendémiaire was later welcomed at the Port of Suva. Mr Djokovic later announced that the French Navy would help Fiji in times of natural disasters. He confirmed that the Fiji Navy and French Navy have signed a two-year co-operation agreement covering 2015-2016. “This will include exercise and strategic dialogue,” Mr Djokovic added. Meanwhile, the Le Vendemiaire will be here for a couple of days and will be open to members of the public for tours and visits. Fiji Navy officer Sub Lieutenant Apakuki Tukana was a proud man after arriving in Suva on the Le Vendémiaire. “I was sailing for five weeks and the training was great and I must say that it was an experience of a lifetime after sailing in a bigger ship,” he said. Sub Lieutenant Tukana, who hails from Waiqori, Oneata in Lau, said the ship was fully equipped and even had a helicopter.